This month: “A Woman Under the Influence”, “All About My Mother”, “American Graffiti”, “Assassination of a High School President”, “Badlands”, “Blue Valentine”, “Broadcast News”, “Crimewave”, “Days of Heaven” (pictured above), “Enter the Void”, “Following”, “Howard Stern’s Private Parts”, “Lost and Delirious”, “Morning Glory”, “Never Let Me Go”, “Paul”, “Rashomon”, “The Switch”, “Talk to Her”, “Tamara Drewe”, “This is England”, “Tokyo Story”, “True Grit”, “Unmade Beds” and “Women on the Verge of a Nervous Breakdown”. This month, the average rating is 6.08/10, and the film of the month is Days of Heaven. I’ve spent the last seven hours listen to heavy drone metal. I’m not really enjoying it, but I think that’s the point. Follow @halfacanyon for more. A Woman Under the Influence is the kind of film you really love or really hate. Yet, impossibly, I’m in neither category. American Graffiti is a goofy coming-of-age tale about teenage slackers and their “crazy” escapades one night. You get what is says on the tin (apart from any American graffiti), but pales in comparison with Dazed and Confused and subUrubia. It is rumoured that the new Star Wars film has been cancelled because of a power cut, so George Lucas is doing that thing with a wire and a potato. Setting a neo-noir mystery in an American high school isn’t a wholly original idea. It’s already been done in Brick, Veronica Mars and many sitcoms (I assume, without using Google). Assassination of a High School President brings a slight twist by using more direct references to existing classics – this dive for originality backfires, and helps explain why the film was a straight-to-DVD release. For example, if you’re familiar with the film Chinatown, you can guess the ending. And, by the way, the Faye Dunaway role is filled by Mischa Barton. Elsewhere, the jokes mostly fall flat through poor timing. The assassination of Kennedy is re-enacted with a paintball gun, but the sequence feels longer than Reagan’s residency. Badlands swings from poetry into simply just waiting for a murder. 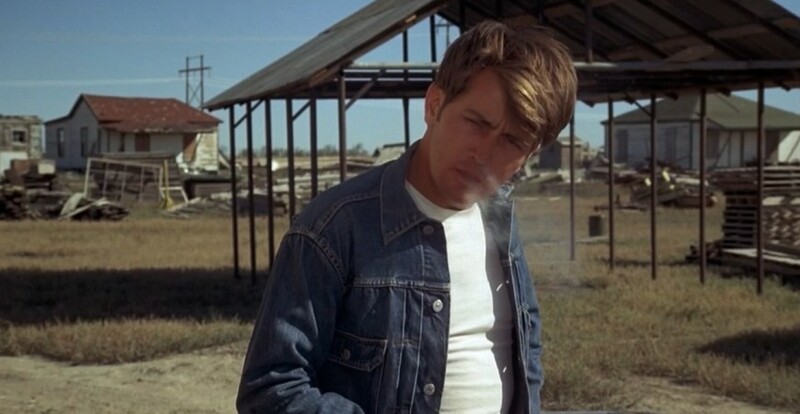 Perhaps to compensate for the lull at the end of the second act, Malick introduces social commentary into the final act with Sheen enjoying the media attention – he gives himself up on purpose, tossing his comb to the audience – but it shoves Badlands into an eponymous area. 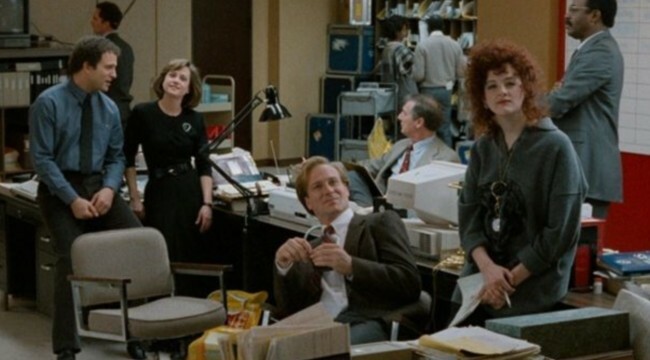 The office is rocked when William Hurt steps in as a famous sports reporter entering the world of serious news. He lacks political knowledge, and relies on Holly Hunter to feed him, word by word, through an earpiece. He uses this experience as an opportunity to use a chat-up line on her afterwards about wanting her voice inside his head all the time, and then the film spirals a little. The Coens and Sam Raimi collaborated for the screenplay of The Hudsucker Proxy, which is one of my favourite films. 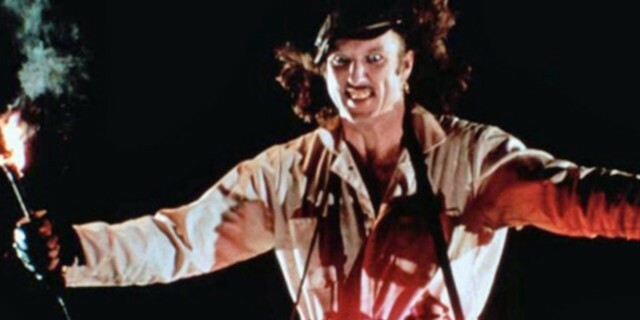 However, the “demo” version was Crimewave, an overly fond pastiche of slapstick and screwball comedy. The essence of Crimewave is destructed by its self-awareness – a lesson learned, as seen in the interior mechanics of The Hudsucker Proxy – whilst lacking the relentless of Raimi’s own Evil Dead trilogy. Legend has it – or, what I read on Wikipedia – that Terrence Malick took two years to edit Days of Heaven, and it shows. The cinematography is so beautiful that an art gallery – or, at the very least, a tumblr – could be made from still photographs from the film. The camera controls the essence, but is moved by trains, the sun and whatever music is being played in the background. 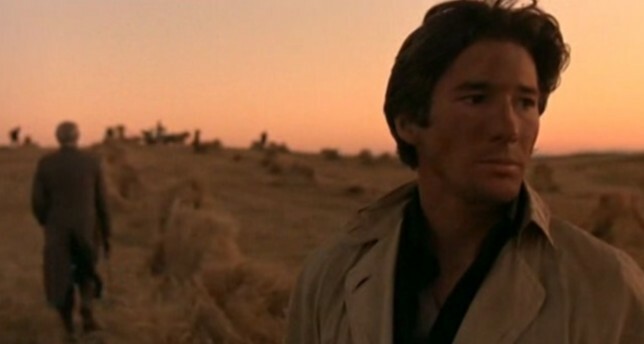 There is sunlight, but the world could collapse on Richard Gere at any moment; only he and I know it. Linda Manz – yes, the girl sampled in Primal Scream’s “Kill All Hippies” – narrates Days of Heaven. The simple plot involves a couple who pretend to be brother and sister (to avoid gossip) and become labourers on the run. They hatch a scheme that involves a wealthy, dying farmer, which creates a love triangle – as opposed to a Toblerone, which is just a lovely triangle. However, the real story is how poetry can be created from a catharsis of sunburn and lovelorn wheat. Despite the sugary opening credits, Enter the Void is an extremely unpleasant way to spend three hours. It was, in many ways, a reminder of the worst moments of my life that never actually happened. After a less-than-subtle introduction of the values of The Tibetan Book of the Dead, the bland protagonist is killed in a drugs raid. However, he floats around as a spirit, watching his sister and some other things. We are taken along this slow and visually enthralling journey, but it’s a bit like listening to a really beautiful person telling you about what they dreamed of last night – you don’t care, but you don’t mind looking. Well, if you’re a sociopath. 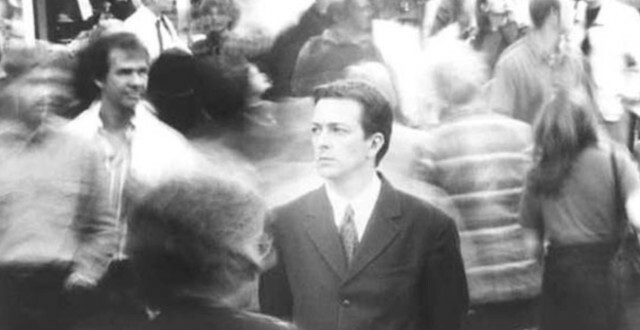 Christopher Nolan’s debut feature, Following, is a low-budget neo-noir thriller that jumps in a non-chronological order. The gritty black-and-white is accompanied by a sputtering soundtrack and amateur actors who indulge Nolan’s screenplay. Like many films Nolan would later direct, Following tries to be as complicated as possible, but the final twist doesn’t pay off. Instead, you’re left with the earliest evidence that Nolan’s ambitions are probably greater than his writing talents. I don’t know how familiar you are with Howard Stern. Over here, in England, people are aware of the massive influence his radio show has in America. However, not so many of us have actually heard of him. Apart from a few losers with too much time. Like this person. Writing right now. On his own. In the middle of the night. Drinking whisky. Trying to remember why I watched this film. The main selling point of the radio show is the celebrity interviews, in which Stern asks the same questions over and over again, so much so that the interviewee eventually gives in. This is a remarkable talent, especially listening to audio of famously private figures like David Letterman and Jerry Seinfeld slowly losing their temper with someone they don’t want to castigate because of his listening figures. But none of that’s in the film – it’s just an unfunny man making unfunny jokes, and here I am, writing about it, wondering why my life can’t be even a fraction as successful as his. I watched Lost and Delirious by accident. I actually expected to be watching Delirious, a Tom DiCillo film starring Steve Buscemi. Instead I ended up seeing a coming-of-age lesbian love story based on a novel called The Wives of Bath that involves broken mirrors, gardening and a vicious bird that eats worms. Not what I was expecting, but at least I didn’t end up with a JJ Abrams drama set on an island. Rachel McAdams is a wannabe journalist. Hey, who isn’t? Anyway, she anchors a trashy morning television show, helmed by Diane Keaton and Harrison Ford, which she wants to succeed. Hey, who doesn’t? 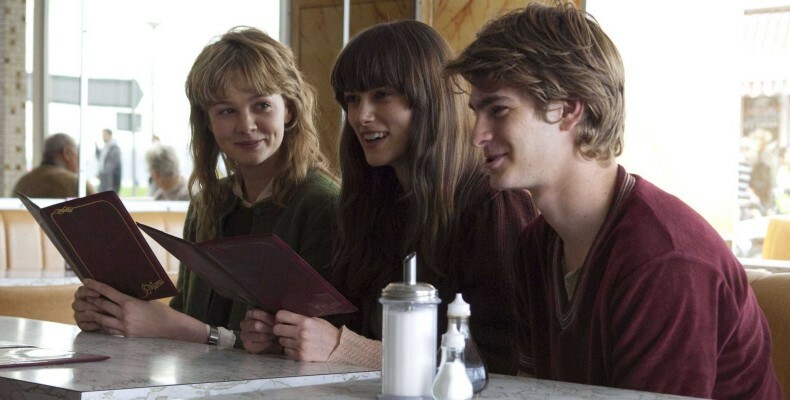 The novel of Never Let Me Go really drags – not just because of the oncoming force velocity – and takes an age for the ‘twist’ to be revealed. In the film adaptation, the ‘twist’ is reveals in the first few seconds, subtitled, just in case you’re too stupid to understand any other method of exposition. Dumbing down, perhaps, but it’s effective. Paul is written by Simon Pegg and Nick Frost. That may seem like a strange sentence to start a review, but that’s the only reason why 90% of audiences flocked to see a film with so little energy. 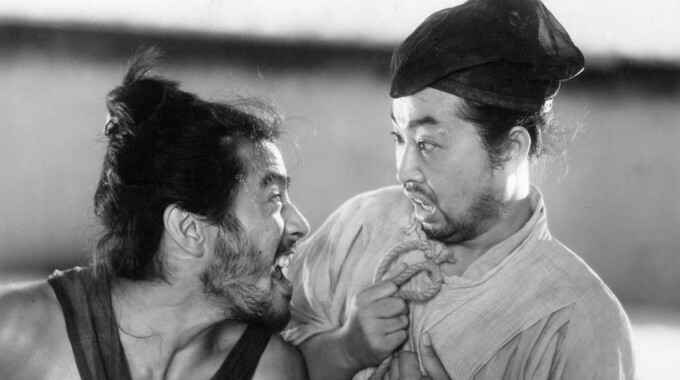 In Rashomon, the early scenes are played out with a serene headache – rain scatters across a confused man, and no one sings, “Hallelujah.” We are treated to four different accounts of the events that led to a dead body in the forest. Of course, these contradictory narratives prove you can’t rely on one person alone, so what’s the point of you reading this review? Well, The Switch is sort-of a fucked up version of a mainstream romcom. The plot also involves a child’s head full of lice, which reminds me: my head is full of lies. I’ve spent the last three months writing a screenplay called Highlights From Our Fate about a coma victim. I haven’t written much of it, partly because I’m slow, but I’m concerned about the scientific inaccuracy. While You Were Sleeping and Seinfeld aren’t too concerned – a finger moves, the eyes open, and it’s the perfect romantic encounter. But not Talk to Her. Here, the coma isn’t a plot point, but a symbol. Falling in love with a comatose dancer, a male healthcare worker tries to live the life she would have wanted, so he visits museums and theatres. 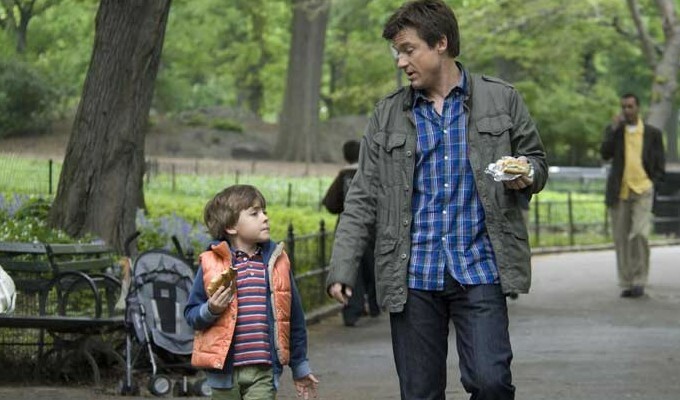 Despite some quirky camera techniques and fantasy sequences, the film aims for a certain degree of realism with its subject matter, and does so with occasional moments of dialogue where doctors will explain the science of comas. In researching my own screenplay, I had a quick look on Yahoo Answers, and most of the best received responses were transcriptions from Talk to Her. I saw this months ago, but forgot to review it. I also can’t remember anything about it, other than I wanted to give it 8/10. I’ve knocked the score down as the film clearly wasn’t ‘unforgettable’. 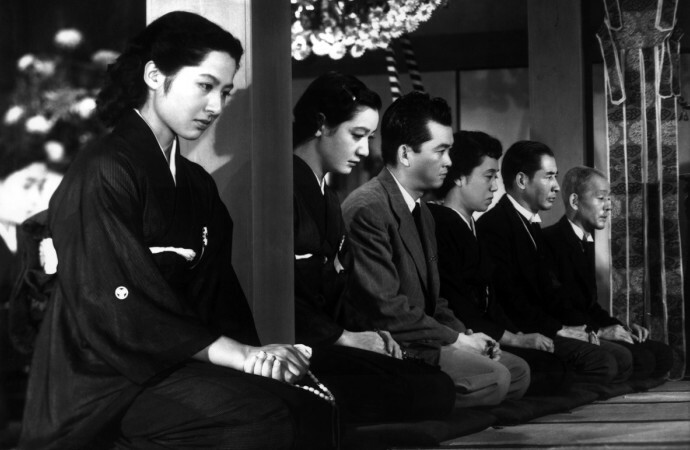 The camera barely moves in Tokyo Story, and neither does the plot. This doesn’t really matter as the film’s essence lies in the placid lines of dialogue that remind me of a nightmare I had after drinking too much coca cola on a Thursday afternoon. The urgency of Japan’s new generation of workers contrasts with the patient black-and-white drops of eerie space, where cupboards have been dusted but remain empty. Your heart breaks when you see the older generation feel left out, because you see your past, present and future in front of you. If you want an engrossing amalgamation of Paper Moon and Winter’s Bone, then you might like True Grit. It might be hard to work out what Jeff Bridges is saying, but I’m fairly certain insults sound better in a southern accent. True Grit is a wonderful remake that truly deserves critical analysis, so the worst way to review it would be to rank what I’ve seen of the Coen brothers’ filmography. That is an example of the meandering dialogue featured in Unmade Beds that you probably recognise from countless other films, and possibly from the emptiest, loneliest parts of your drunken memory. So why does it work in Unmade Beds? The cut-up style of Unmade Beds is a reminder of the vacuous nature of life – as if you could ever forget – and this is, probably unintentionally, helped with the screenplay’s corridor of vague mattress metaphors. You end up with that dizzy feeling you get when you wake up from a gorgeous dream you can’t really remember. Or, I was drunk when I watched this, and I couldn’t really remember what happened when I woke up the next day. Sadly, the DVD wasn’t the edition that makes you laugh or keeps you awake. This entry was posted in Film review and tagged Akira Kurosawa, Alexis Dos Santos, Betty Thomas, Brett Simon, Christopher Nolan, Coen brothers, Derek Cianfrance, Gaspar Noé, George Lucas, Greg Mottola, James L Brooks, John Cassavettes, Josh Gordon, Léa Pool, Mark Romanek, Pedro Almodóvar, Roger Mitchell, Sam Raimi, Shane Meadows, Terrence Malick, Will Speck, Yasujirō Ozu. Bookmark the permalink.